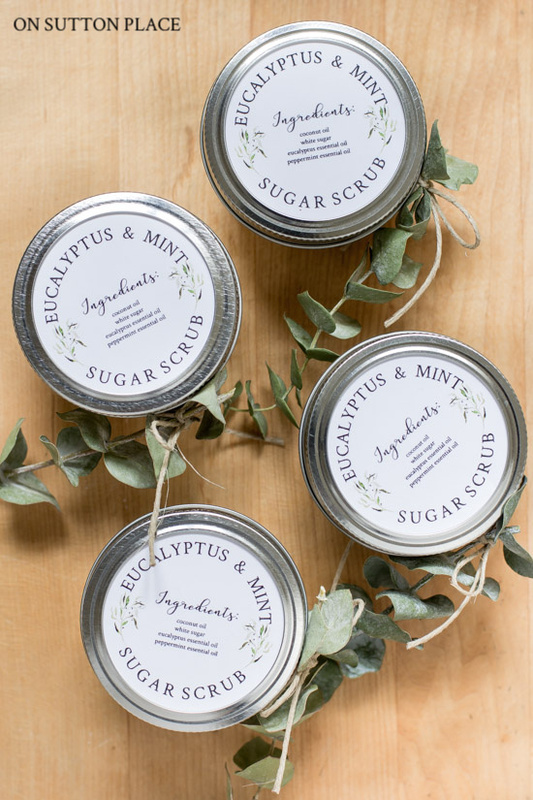 DIY Sugar Scrub: Eucalyptus & Mint…The Perfect Gift! 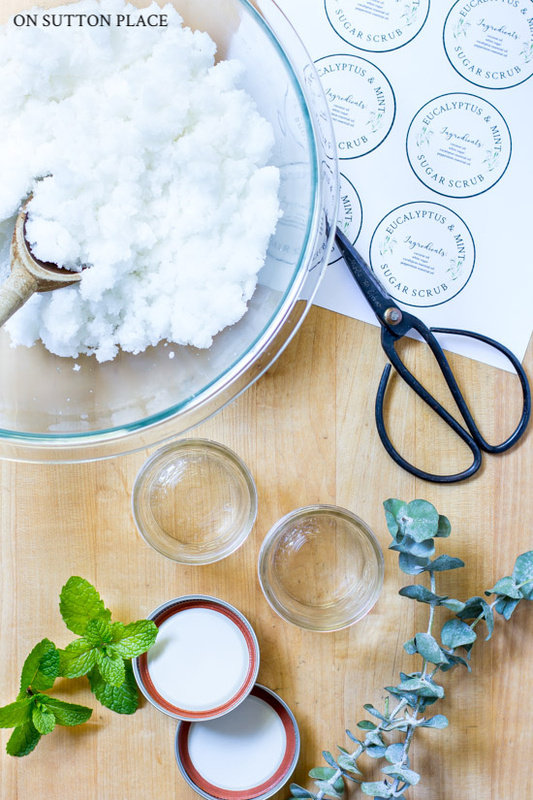 In this post: Eucalyptus & Mint DIY sugar scrub that makes the perfect gift for someone else or for yourself. This scented scrub is the answer to dry hands! Dry hands are no fun. They can be itchy and downright painful. You can win the battle against dry skin by using one simple product…and it’s one that you can make yourself. DIY sugar scrub is easy and inexpensive to make, and it is a total game-changer if you suffer from dry hands. Keep a jar beside every sink and use it on a regular basis. It will exfoliate away the dead skin and add the necessary moisture needed to combat cold and dry elements. It absolutely works miracles on dry cuticles and it smells good at the same time! This recipe will make approximately two 4 oz. jars. Place the jar of coconut oil in the microwave. Warm for 10 – 20 seconds. It doesn’t need to be melted, just soft enough to spoon into the measuring cup. Combine the sugar and coconut oil in a mixing bowl. Add essential oil and stir until well combined. Using a 2-inch scoop, put into mason jars. To apply the labels: Download the label template. Print the page on good quality cardstock. Cut out the circles. Using double-sided tape, attach a label to each mason jar lid. Seal the jars tightly. The basic recipe for sugar scrub is one part oil to four parts sugar. A recipe using 1 cup of coconut oil and 4 cups of sugar will yield about eight 4 oz. mason jars. This is the amount I usually make. The amount of essential oil added is a personal choice. I like to open a jar of sugar scrub and smell it immediately. I usually use more essential oil than the recipe calls for. A drop or two of green food coloring can be added for a little extra color. 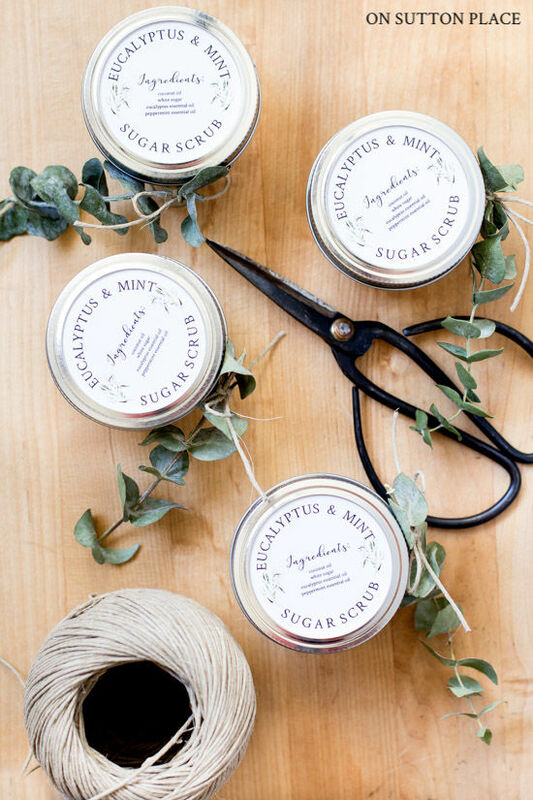 DIY sugar scrub tightly packaged in glass mason jars has a shelf life of several months. Just recently, I opened a jar that was about a year old and it was perfectly fine…although I wouldn’t recommend keeping it that long. Any brand of organic coconut oil will work. I picked up a jar of Spectrum Coconut Oil at my grocery store. Something homemade and personal, like this DIY sugar scrub, makes the perfect gift. Give to family, friends, coworkers, teachers…basically anyone who may benefit from the moisturizing and exfoliating benefits. I’ve included printable labels that add a custom touch. It’s also looks pretty to tie a sprig of fresh or dried eucalyptus around the jar with twine. Presentation is part of the fun! More DIY sugar scrub recipes! To my email subscribers: the printable labels can be found in the Members Only Library. 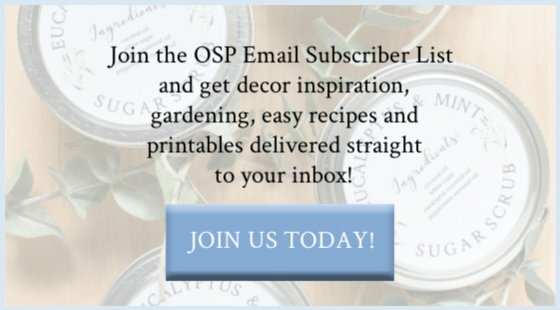 If you aren’t a subscriber, but would like to join us and get the labels, click the button below! I have been making DIY sugar scrub for a few years…and I can honestly say that it makes all the difference in the way my hands feel. I use it year round. I don’t have issues with cracks around my nails or dry, sore cuticles. I don’t get manicures on a regular basis, so if I’m going out and want my hands to look nice, a quick application of sugar scrub does the trick. I made a huge batch of this (2 cups coconut oil, 8 cups sugar and corresponding essential oils) and it made enough to take care of my whole gift list of teachers, bus drivers, neighbors, co-workers, etc. It was so easy and such a great gift (not to mention economical when you think of how many gifts are made from this)! 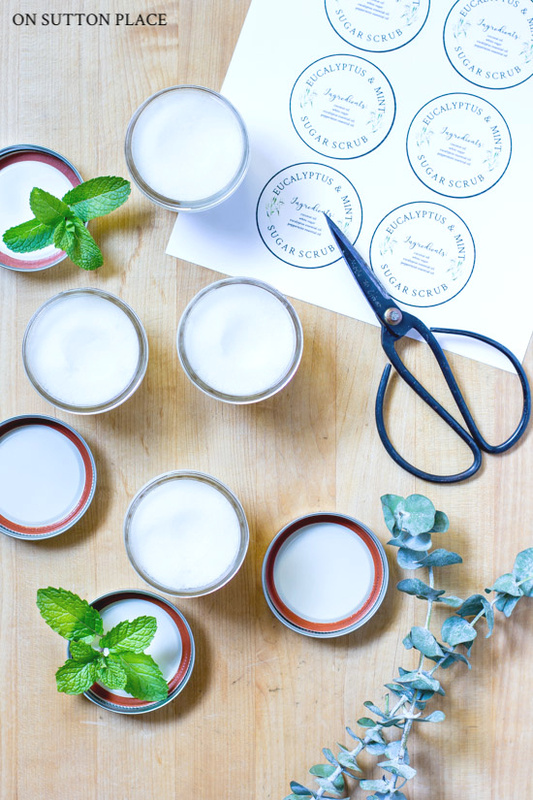 Thanks for the awesome printable for the labels as well – it adds a real classy touch! I love ideas like this, so please keep them coming!! Merry Christmas! I just made your sugar scrub and love, love, love it. It will definitely be coming up as gifts. Thank you for sharing. This is fantastic Ann, and the labels are beautiful! Thank you for sharing such an awesome gift idea! Is there something else besides coconut oil U could use? I am allergic to cocnut but would love to make this. Thank you. Hi Vicki! Yes…any kind of oil can be used. Organic canola oil or olive oil would work great. Keep in mind that the olive oil might give the scrub a greenish tint, but that would be OK with the eucalyptus and mint. Enjoy! Hi Ann. These are the perfect DIY gift for teachers, bus driver, work colleagues! Wondering if the printable labels will work with Avery 2 1/2 inch diameter round labels that can go in the printer. I think there are 10 per sheet. Thanks for your ideas! Hi Valerie…the template currently isn’t formatted for printable labels. I print on cardstock and attach the label to the jar lid with double-sided tape. My printer needs replaced so my labels look a bit light. On a good printer, they would be clear and easily readable. I hope this helps! Love this! Perfect for gift giving. Thanks again Ann! Thank you for posting this recipe and labels. It is something I definitely want to try. The labels are darling. This is a wonderful recipe for a sugar scrub. I love the labels too. Thank you for sharing. It will make nice gifts.